The pole positions have been decided for the Good to Go 2500 race. Click here to play! All the best racers have turned out to take on one of the world's most challenging race tracks in an endurance race that tests drivers to their limits. Due to a number of horrific accidents last year, however, no drivers will be racing inside the cars anymore. Instead, they have been given specially designed interfaces that look a lot like slot machines, which they play in a remote location. By lining up the right symbols, racers control their cars and keep them on optimal racing lines. It's an exciting new change to the sport that could see a whole new crop of elite racers emerge! The symbols they will use to control their cars include drivers, pit girls, red cards, chequered flags, G2G symbols, and many more. Play the Good to Go slots today and see if you can take first place in the prestigious Good to Go 2500 race, the first motor sports event controlled by slot machines. The Speedometer symbol is the scatter symbol in this game, and it pays out on the total bet when enough symbols are scattered across the reels, from reel 1 and then continued on adjacent reels. 2 symbols win twice the total bet, 3 symbols win 6 times the bet, 4 symbols win 20 times the bet, and 5 symbols win 50 times the total bet. 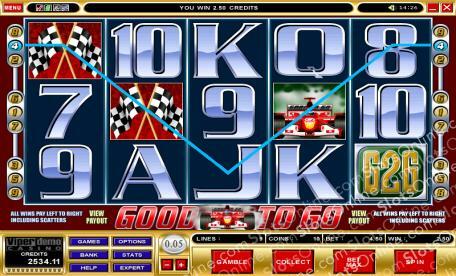 2 or more Speedometer symbols from reels 1 onward to adjacent reels also trigger the free spins feature for 3 free spins. Every time a Speedometer symbol lands on the reels in free spins, it is kept and held to help the player earn more free spins. The Pit Girl symbol is wild and substitutes for all symbols other than scatter and bonus symbols. There is a bonus gamble game used to gamble winnings on the reels. In it, the player wagers their win as the stake and guesses what color a playing card will be. A correct guess doubles the stake, while an incorrect guess loses the stake.